This Frosty Lemon Chiller is a delicious Healthy Living beverage made with sweet, juicy peaches, pineapples and banana. Place yogurt, peaches, pineapple with its juice, the banana, drink mix and ice in blender; cover. Blend on high speed until smooth. 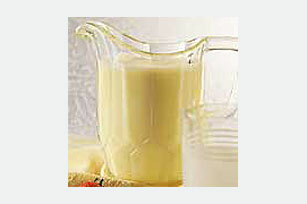 Pour water into large plastic or glass pitcher. Add yogurt mixture; stir until well blended. Serve over ice cubes in tall glasses. Top each serving with a strawberry. Substitute 1 can (8 oz.) crushed pineapple in unsweetened juice for the pineapple chunks.